Members of Montenegro’s LGBT community march down a street in Podgorica, Montenegro, Sunday, Nov. 2, 2014, protected by hundreds of riot police. 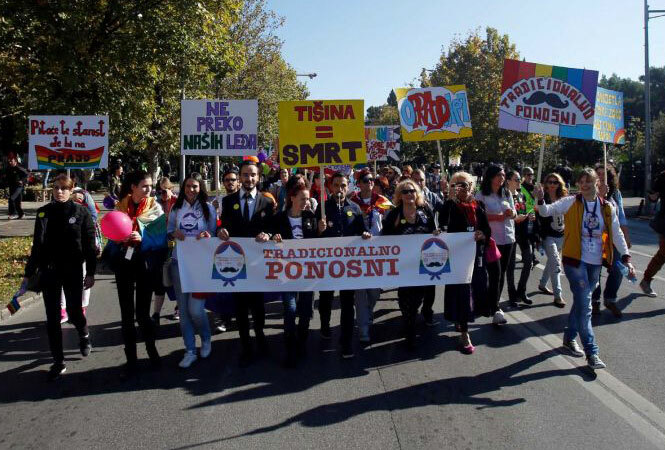 Members of the Montenegrian gay community march down a street in Podgorica, Montenegro, Sunday, Nov. 2, 2014. Carrying banners reading “Let’s Love Each Other” or “This is Just Beginning,” gay activists gathered Sunday in the capital Podgorica, as police deployed heavily, practically blocking the city center. Protected by hundreds of riot police, about two hundred gay activists marched peacefully in the staunchly conservative Balkan country seeking EU membership. PODGORICA, Montenegro — Protected by hundreds of riot police, about 200 gay activists marched peacefully on Sunday in Montenegro, a staunchly conservative Balkan country seeking EU membership. 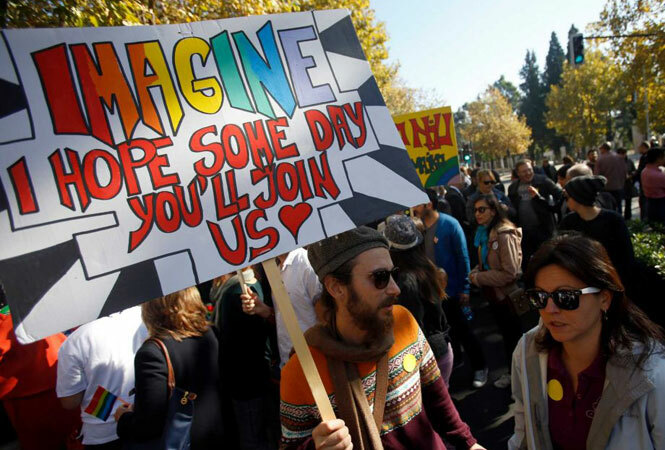 Carrying banners reading “Let’s Love Each Other” or “This is Just Beginning,” gay activists gathered in the capital, Podgorica, as police deployed heavily, practically blocking the city center. No incidents were reported, unlike in previous years when police fought right-wing extremists and gay activists had to be evacuated. Police said they questioned nearly a hundred potential trouble-makers and found a sack of flammable materials. Two minors will face charges for planning to attack the march with petrol bombs, police said. Montenegro, like much of the Balkans, has a strong macho male culture with little tolerance for gays, who often face harassment or attacks from right-wing or hooligan groups. But Balkan countries must protect human rights to advance in EU membership bids. Mitja Drobnic, the head of the EU mission in Montenegro, praised the government for securing the event. A massive police presence also marked a pride event in neighboring Serbia in September.